This is just a QQ International Today Remover,what it dose is just as the name saying,remove the today nag windows.I just cracked the plugin self check functions.so that u can add or delete plugins as u wish(if u dislike the plugins tencent forced u to use, u can just delete it. ).Click here to download the patch file (window xp only, if u are using windows 7,just read the bellow contents.thx )[there is something wrong in the patch file ,so i delete the download link. ],and just place it into the QQ installed directory(the default directory is C:\Program Files\Tencent\QQIntl), run the program and click patch to remove the today popup window.lol. if u find any problems or bugs just leave a message here,i will have a try to solve the problem.lol. 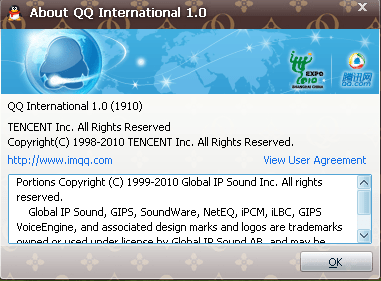 if u don’t have QQ International installed just click here to get one. However i noticed that if u destroy the city weekend plugin,or remove this plugin ,there are some buttons missing.just as the bellow.I am so sorry that i can’t fix that problem. This patch is designed for version 1.0(1910),if u get the beta version u have to find another patch. If u are using win7,u will get an error box like this. But thers is no such error message on windows xp. I have update the patch,click here to download the latest version of patch. (something error will be fixed tomorrow.so sorry)there are two patchs one for xp,and the other is for win7,just chose the correct one via ur os version.IF u don’t know how to use the patch just read the readme file in the rar packge. IF IT WORKS WELL NOW ,JUST POST A COMMENT LIKE “IT WORKS NOW”,GREAT THX FOR UR SUPPORT. I have noticed that the PE file header was modified after the file patched,so if u run the QQ it will show u a crash window.I don’t know why this happened. so now the safe way is just replace the AppMisc.dll with this file(click here to download this file ) i provide u .if any problems just leave a messge here .thx. Now it can work on windows xp(tested via vmware) and window 7 64bit version (tested on my own PC),lol.so just have a try and good luck! It looks ugly ,but it real works(place the patch file into the /bin/ directory). Any bugs ,just comment in that post thx. First of all. Thx for this great patch. Instead of deleting the whole weekend folder. try to just delete CityWeekend.dll within C:\Program Files\Tencent\QQIntl\Plugin\Com.Tencent.CityWeekend. yeah, i notice that problem also,in the old version patch i modified the cityweekend dll rather than delete it .but in this patch i just patch the selfcheck function of the dll. so if u delete whole the plugin directory some buttons will missing. I am glad to see u like this patch. QQ 1.1 is out, but it offers no new features. We are expecting, thx for all you have done.